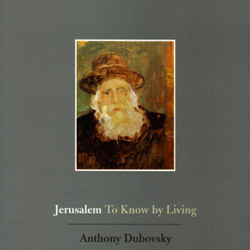 In the 1990s, American painter Anthony Dubovsky visited Jerusalem and found himself drawn to the historic neighborhood of Mea She’arim, whose people follow traditional ways. Dubovsky began walking the streets of the old neighborhood at dawn, before the heat of the day and while the doves were still cooing, carrying his sketchbooks and pens. Soon he had settled into drawing Mea She’arim without quite knowing why, and its people had settled into accommodating him. They let him know them by living. Dubovsky sketched the haredim of Mea She’arim outside the argument. Rather, as with all fine artists, he viewed what he was drawn to with passionate attention, with readiness to see. Dubovsky’s quavery touch and rich, subtle colors are very seductive. The paintings don’t look like anybody else’s, though artists as disparate as Bonnard and Ryder come to mind...Yet [Dubovsky's] work is suffused with an exile’s yearning. In the 79 works on cardboard, particularly, one finds a love of cultural variety. It is almost as if Dubovsky is trying to catch and preserve images of all the most beautiful things and feelings in the world and is cannily hiding them in plain sight on the most humble and impermanent of materials. would be seen as a master. read this book is to indulge your mind and your senses. ANTHONY DUBOVSKY was born in San Diego, California, in 1945. He studied with Willard Midgette at Reed College, and has lived in Warsaw, Amsterdam, Buenos Aires, and Jerusalem. He is the recipient of the first annual Adler Award, and his paintings have been exhibited internationally. He teaches at the University of California, Berkeley.